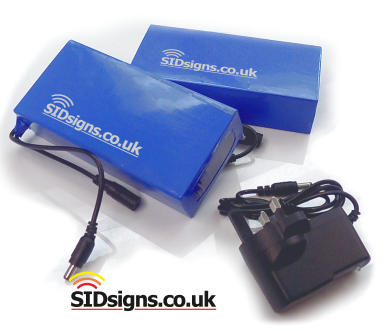 ﻿ Using lithium ion batteries with your sid sign system. The use of lithium ion batteries to power sid devices and speed signs has been a prohibitively expensive prospect. Very expensive purchase costs or limited storage capacities mean that lithium ion hasn't been a practical option. This has changed. 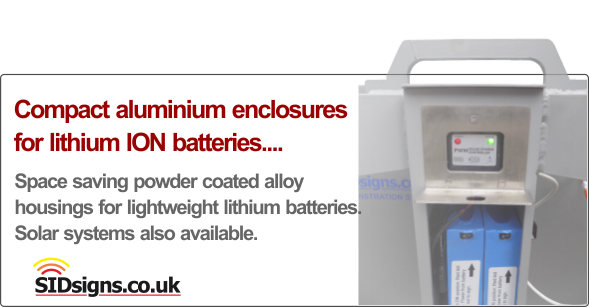 Using lithium ion batteries with your speed sign is now a viable, cost effective alternative to sealed lead acid technology. 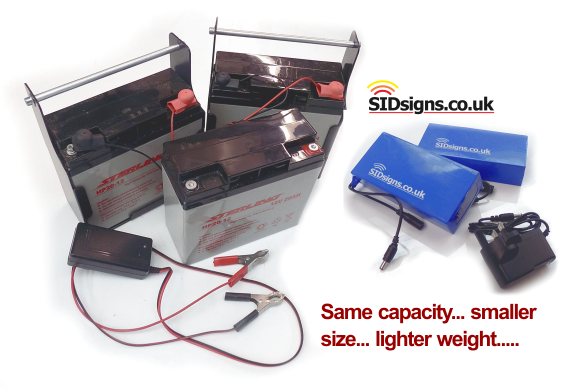 This image shows a pair of lithium ion sid batteries with a storage capacity of 20ah each; the same electrical capacity as a much bigger, far heavier SLA alternative. With faster charging characteristics, greater usable storage capacity and memory free operation, lithium ION batteries deliver more usable power without the bulk or weight of conventional battery technology. This type of storage device can be recharged more quickly at higher amperage rates. Higher charge, discharge tolerance mean that LiON batteries have a longer service life than most alternative technologies. Each battery comes with it's own intelligent UK 3 pin charger with simple led indicators showing charge state and cycle completion. Use this device to quickly and safely restore stored electrical energy. Far smaller, much lighter. These characteristics allow battery boxes and enclosures to be far smaller and compact than conventional SLA products. 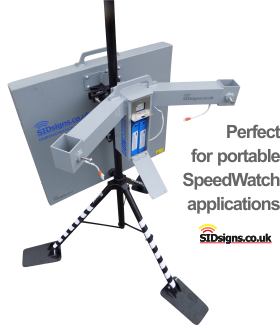 If you are looking for a speed watch type sid sign then one powered by lithium ion gives you the smallest, lightest possible system. If we look at this tripod mounted sid display we can see that's it's powered by a pair of 20amp hour LiON batteries. Tucked inside an aluminium case which is just 150mm wide this is a perfect demonstration of just how compact this type of power storage is. Want to use solar assistance to help recharge your lithium power speed sign? no problem. The arms you can see on the picture above are designed to hold a pair of photo voltaic panels which route back to a small solar regulator tucked away above the batteries. It's important to remember that LiON and SLA technologies are not interchangeable so chargers and regulators cannot be swapped between different battery types.